La Fenice in Venice was one of various landmarks ravaged by fire over the years. Overnight September 2-3, 2018, Brazil's National Museum, north of Rio de Janeiro, was ravaged by a massive fire. Latin America's largest natural history and anthropology museum held more than 20 million artefacts and 530,000 titles. The museum was particularly reputed for the richness of its paleontology department with more than 26,000 fossils, including a dinosaur skeleton discovered in Brazil's central Minas Gerais. 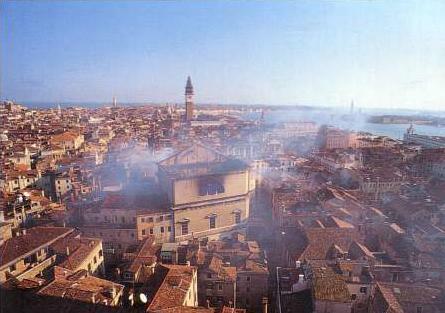 In 1996 Venice's celebrated opera house La Fenice was gutted by fire. In 1994 the Gran Teatre del Liceu, Barcelona's world-famous opera house was destroyed by fire. One of Spain's cultural jewels, the 150-year-old theatre was gutted in a blaze in which only the foyer and the horseshoe arch over the auditorium were left standing. It has since been reconstructed. A major fire at Windsor Castle, west of London, on November 20, 1992, destroyed the northeastern part of the royal site, the queen's weekend residence. Bosnia's 19th century National Library was destroyed in the war-time siege of the city of Sarajevo, overnight on 25-26 August 1992. Only some 10 per cent of its resources were saved from the resulting fire. In 1951 the Grand Theatre of Geneva in Switzerland, built in the 19th century, was devastated in a fire that began during the preparation for a performance of Richard Wagner's "The Valkyrie". Why is the world crying for Paris's Notre-Dame?